Google Calendar Has Been Redesigned, How About Google Docs? Google Docs, as well as Google Drive, is a huge business for Google. Throughout high school, and college, I've noticed that fewer and fewer people use Microsoft Office, and choose Google Drive. Of course, when something works, don't break it. However, some things could be improved. Ever since I was a kid, I've always loved automobiles. I'm not a mechanic, I wish I had that knowledge, I just love driving and being around cars. However, I've never liked the normal cars that most people my age enjoy. Here's a few of them. In around the last week of June or the first week of July, I bought a pair of Adidas Neo shoes for around $60. I figure Adidas is a reputable company, and these should last me a bit. 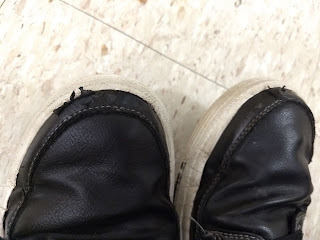 A week ago, I noticed on the left shoe, the glue connecting the bottom half of the shoe to the top, the part that seals the shoe, was separating almost completely. This angers me, especially anytime I encounter a puddle, because I am a man who does not appreciate wet socks. Nor do I appreciate a shoe that depreciates so rapidly after some three months. Now look, Adidas is a fine, competent shoe company typically, I probably just bought the shoes that were made Friday night. But this also isn't the first time a pricey pair of shoes crapped out on my in a relatively short amount of time. Air conditioningLight up cup holders4WDSpeed sensitive intermittent windshield wipersThis thing that stops the car from rolling backwards when on a hill, which is nice with the manual transmissionA flashlight in the ceilingThe visors extendDecent four-door speakers Now, I'm not complaining, I bought the car because I like it a lot, I just thought it was funny how much comes standard, or can be optioned in besides power convenience. I thought I'd make a quick post about the oddities of the Jeep Patriot. Any product can be odd, but some things are more odd than others. This isn't a bad thing, it's just whatever you can live with. So here's a list in no order whatsoever.